Do you ever find yourself reading the scriptures and it's like they're brand new again? That happened to me yesterday as I read these verses from the book of Moroni, chapter 7. I don't know exactly why these words stuck out to me so much. Maybe it's because of all the talk about ANGELS and CHRIST and now is the season we focus on those things more than ever. Perhaps it is because I LOVE the idea of angels being all around us, of them even showing themselves to us if we have enough faith. I wonder if I've ever seen one. I think if I saw an angel, he or she would be smiling, like the woman I passed walking down the sidewalk this week. It could be because of the amazing promise that if I ASK in faith, I will receive. But whatever the reason, I found myself pondering these words, reading them over and over, grateful for the Savior and all the good He brings to the world, believing with all my heart that angels do surround us, that they help us, that they inspire us to be a little better, to lend a helping hand, to hold on in hard times, to serve those in need, to love and cherish one another. It reminds me of my children, how close to Heaven they still are. They are my most constant angels. I think of how bleak the world would be this time of year without these reminders, how long the winter would drag on, and I am grateful. Here are the words that touched me so deeply. "For behold, God knowing all things, being from everlasting to everlasting, behold, he sent angels to minister unto the children of men, to make manifest concerning the coming of Christ; and in Christ there should come every good thing. And God also declared unto prophets, by his own mouth, that Christ should come. And behold, there were divers ways that he did manifest things unto the children of men, which were good; and all things which are good cometh of Christ; otherwise men were fallen, and there could no good thing come unto them. And after that he came men also were saved by faith in his name; and by faith, they become the sons of God. And as surely as Christ liveth he spake these words unto our fathers, saying: Whatsoever thing ye shall ask the Father in my name, which is good, in faith believing that ye shall receive, behold, it shall be done unto you. For he hath answered the ends of the law, and he claimeth all those who have faith in him; and they who have faith in him will cleave unto every good thing; wherefore he advocateth the cause of the children of men; and he dwelleth eternally in the heavens. For behold, they are subject unto him, to minister according to the word of his command, showing themselves unto them of strong faith and a firm mind in every form of godliness." 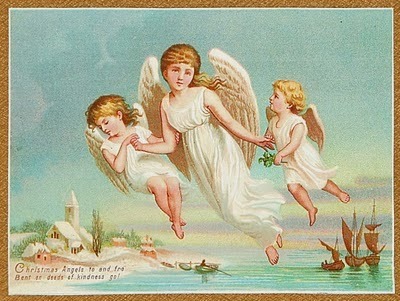 I hope we all experience the blessings of Christ, His angels, and miracles this Christmas season.